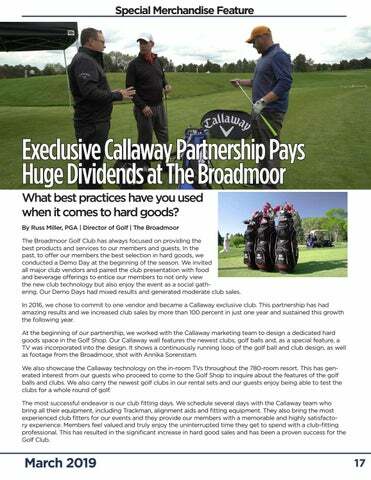 Execlusive Callaway Partnership Pays Huge Dividends at The Broadmoor What best practices have you used when it comes to hard goods? By Russ Miller, PGA | Director of Golf | The Broadmoor The Broadmoor Golf Club has always focused on providing the best products and services to our members and guests. In the past, to offer our members the best selection in hard goods, we conducted a Demo Day at the beginning of the season. We invited all major club vendors and paired the club presentation with food and beverage offerings to entice our members to not only view the new club technology but also enjoy the event as a social gathering. Our Demo Days had mixed results and generated moderate club sales. In 2016, we chose to commit to one vendor and became a Callaway exclusive club. This partnership has had amazing results and we increased club sales by more than 100 percent in just one year and sustained this growth the following year. At the beginning of our partnership, we worked with the Callaway marketing team to design a dedicated hard goods space in the Golf Shop. Our Callaway wall features the newest clubs, golf balls and, as a special feature, a TV was incorporated into the design. It shows a continuously running loop of the golf ball and club design, as well as footage from the Broadmoor, shot with Annika Sorenstam. We also showcase the Callaway technology on the in-room TVs throughout the 780-room resort. This has generated interest from our guests who proceed to come to the Golf Shop to inquire about the features of the golf balls and clubs. We also carry the newest golf clubs in our rental sets and our guests enjoy being able to test the clubs for a whole round of golf. The most successful endeavor is our club fitting days. We schedule several days with the Callaway team who bring all their equipment, including Trackman, alignment aids and fitting equipment. They also bring the most experienced club fitters for our events and they provide our members with a memorable and highly satisfactory experience. Members feel valued and truly enjoy the uninterrupted time they get to spend with a club-fitting professional. This has resulted in the significant increase in hard good sales and has been a proven success for the Golf Club.